Rabbi Yudi Steiner, above left, prepares Challah and chicken soup with his family on Thursday night as they prepare to welcome about 100 students into their home for Shabbat dinner Friday. Earlier that day, D.C. Superior Court temporarily lifed a ban that prevented him and his wife from working within a one-mile radius of campus. As students filed into the Virginia Avenue apartment complex’s stairwell, they heard the loud hum of Hebrew prayers and smelled chicken soup. More than 100 students gathered inside the third-floor apartment Friday night, sitting at long tables lined with folding chairs and bottles of kosher Manischewitz wine. 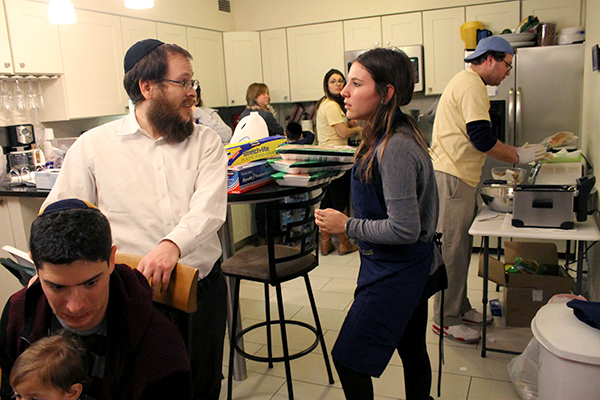 Though Rabbi Yehuda, known as Yudi, and Rivky Steiner have hosted Shabbat, or Sabbath, dinners for students nearly every week since they moved to Foggy Bottom six years ago, last week’s event was different. The Shabbat marked the first of the semester, but it also could be one of the last that the Steiners are allowed to host on behalf of GW Chabad, the University’s chapter of the Jewish life organization. The couple, who have led the organization’s GW chapter since 2008, were fired last semester for violating their contract and were ordered to leave campus. They refused to do so, prompting a legal battle and a groundswell of student support for the Steiners. During a prayer, Rabbi Yudi Steiner thanked attendees for supporting his family’s stay at GW and reminded them to face the adversities life brings. Rabbi Levi Shemtov, who is the top Chabad leader in D.C., fired the Steiners in August, claiming that Yudi Steiner was in breach of his contract for failing to provide Shemtov with updates on GW Chabad activities, work required hours in the D.C. Chabad offices or share information about financial donations given to the organization and the couple. The couple has operated independently – relying on alumni and student donations instead of their Chabad salary – throughout the fall semester. Students began to rally together in the past several weeks as the complaints made their way to D.C. Superior Court. Students say the Steiners have been an integral part of the Jewish community at GW, taking students out for coffee, hosting dinners at their home or in the Chabad lounge every week, and teaching classes about Judaism. After they were fired as the leaders of GW Chabad, students and alumni gathered support for the couple, creating a petition that has now collected almost 1,500 signatures. Those students celebrated Thursday when a judge granted the Steiners a temporary stay, allowing them to continue their work until the next hearing at D.C. Superior Court, which is scheduled for Tuesday. The court put a hold on the previous decision to ban the couple from working within a one-mile radius of campus for the next two years. Rivky Steiner said she and her husband’s only goals are to remain with the students and provide guidance. She said when students live away from home for the first time, they can either lose touch with their faith or they may be inspired to explore it on a deeper level, and she said she hopes that she and Yudi Steiner can offer resources to help those seeking advice. 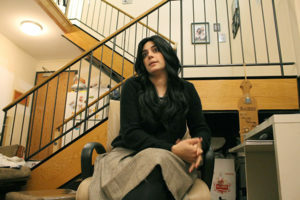 She added that while it was still possible that her husband will be replaced by another rabbi or they will move to another community, the outpouring of support they have received since news of their legal woes broke has encouraged them to stay in place for the foreseeable future. Junior Alec Zimmerman said when he transferred to GW, he barely left his room for his first month on campus. But when he met the Steiners, he said he found his place at GW. Rabbi Yudi and Rivky Steiner hosted a Friday Shabbat dinner, which they’ve done every week since coming to GW six years ago. Last week’s event, though, may be one of the last they hold on behalf of Chabad as they wait for a court to decide their roles. Yudi Steiner was the first person he told when his grandfather passed away, and he said he has spent hours at their home, sometimes until 4 a.m., without anyone hinting that he should go home. Jamie Weiss, a sophomore who has been involved with GW Chabad since she arrived on campus, said Shemtov’s attempt to remove the Steiners is the result of decisions that weigh the importance of Shemtov’s wants over the needs of the students. “When one Jewish person is competing with another for power, it really upsets me because that’s not what our religion is about,” Weiss said. A judge will determine on Tuesday whether the Steiners are permanently allowed back at GW. Shemtov said he believes banning them from campus is still the right move. Shemtov said students “don’t have the whole picture” and are left with incomplete information about their spiritual leaders, but he was prepared to continue an energetic presence on GW’s campus. Dean of Student Affairs Peter Konwerski said while GW is aware of student concerns following the “recent changes within Chabad leadership,” the University is not part of the case. Like other religious institutions on campus, such as GW Hillel and the Newman Center, GW does not have any authority to vet religious leaders who work with students. “GW supports a thriving interfaith community on campus and through the Center for Student Engagement will provide support and appropriate resources to address students’ concerns,” Konwerski said.